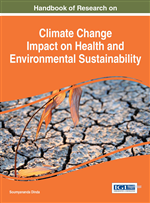 This chapter attempts to correlate different economic issues like inequality, poverty, green infrastructure and international trade with human health in the context of climate change. In this short survey not only we have tried to capture most of the relevant articles in the corresponding category, but also we have shouted for some of the major research gaps in the form of future research agenda. Interestingly from our short survey we have found that importance of developing as well as less developed economies have been neglected in the context of climate change. For the last few decades issues on climate change have been gaining more importance among scientists, politicians and obviously among economists. Moreover, since the first attempt at scientific consensus on climate change nearly four decades ago, scientists have been examined whether climate is indeed changing as a result of human activity. Interestingly, economists over the last few decades have also studied the unfolded relationship between the weather, climate, social factors and human health. However, the complicated relationships between climate change, the environment, socio-economic factors and human health have not gained high priorities for scientific research in most of the developed as well as in developing economies, and hence there exists abundant lacunas in our understanding of these relationships. Such gaps impair our ability to identify optimal strategies for mitigation and adaptation that will prevent illness and death in current human populations while simultaneously protecting the environment and health of future generations. The present environmental distorted economic activities of different developing and developed economies have put themselves in such a situation that climate change is currently affecting public health through myriad environmental consequences such as sea-level rise, changes in precipitation resulting in flooding and drought, heat waves, changes in intensity of hurricanes and storms, degraded air quality and many more of them. It is to be noted that by the inclusion of just four diseases such as cardiovascular disease, malnutrition, diarrhea, and malaria and floods, the World Health Organization (WHO) estimated 166,000 deaths and about 5.5 million disability-adjusted life years (DALYs, a measure of overall disease burden) were attributable to climate change in 2000. To date, the majority of analyses on climate change and health have focused on diseases that predominantly affect people in the developing world, and therefore, are perceived as less relevant to more developed countries. However, Campbell-lendrum (2007) has explained that as the recent pandemic of H1N1 virus has shown us, diseases do not respect international boundaries. We also have identified several issues that are critical to this discussion including susceptible, vulnerable, and displaced populations with several economic activities; public health and health care infrastructure; capacities and skills needed; and communication and education to increase awareness of climate change health effects. In the case of diseases linked to climate change, a number of populations are particularly at risk. Children, pregnant women, and the elderly are generally more susceptible, especially for heat- and weather-related illness and death, vectorborne and zoonotic diseases, and waterborne and food borne illnesses. Also, children and some minority groups are very susceptible to asthma and allergies that may be exacerbated by climate change. Genetic links and markers that help to identify and define susceptible populations exist for many climate-related diseases. Apart from these here we have also considered the issue of climate change and human health in an open economy. It is quite clear from the above two paragraphs that analysis related to climate change and human health should provide more emphasis than what is actually prevailing in most of the economies. The main motivation behind this short survey is that though their exist a large number of works have been done on the basis of climate change and human health, but none of these paper have integrated the issues like human health, economic activities, environment friendly infrastructure and international trade in the context of climate change within a single article. In this respect this is the first attempt has been taken to fill up the lacuna of the existing literature. Moreover, in this chapter we have explained the role of several policies associated with adaptation and mitigation from different harmful effects of climate change in a society. Apart from all of these, this chapter have also encouraged the future researchers of this area not only to accumulate various information from different sections and subsections of this chapter but also they can gather their future research ideas from the section of future research agendas. This is also new in the context of existing literature on climate change and human health.